CATHOLIC schools in Brisbane have embarked on a far-reaching clean energy project that promises big power savings, and with the potential to set the Church on a pioneering path with Laudato Si’. “It’s got huge potential in Australia, and I think it has application overseas,” Jacqui Remond, the co-founder of the Global Catholic Climate Movement and Laudato Si’ consultant on the project, said. The Project is called Living Laudato Si’ – Energy Reduction and Management and will mean a lot more than installing extra solar roofing panels on school buildings – although with large roof areas which could accommodate massive solar panel installation, that could be part of it. The project will incorporate collection of energy consumption data across all 141 schools in the Brisbane Archdiocese, and provide the best case-by-case combinations of solar and ground sourced heat exchange assisted heating cooling and ventilating, eco-power and water storage, LED-lighting, insulation and natural shade, and waste management. “Case by case we will work out what is most efficient at each school site,” BCE building officer and project consultant Rick Dalmau said. The project even goes so far as having a key long term goal of finding the best way to share the excess electricity into the community during those periods when schools are in recess. Mr Dalmau said there was potential for Church buildings and properties right across Brisbane archdiocese to be part of this “ecological conversion”. “This could be a catalyst for a unique co-operation between parishes and schools,” he said. “We have set ourselves challenges, inspired by Laudato Si, that I think are worthy on the world stage. So far, eight schools have been researched in this Brisbane Catholic Education project, with a substantial report written for each school containing eleven key recommendations. BCE is already monitoring electricity time and usage from at least 98 of the 141 schools. It means detailed information about energy used the previous day is available for analysis. Eventually real-time data will be on hand, alerting engineers to power failures or excessive use, and allowing engineers to fine-tune the entire schools system. Ms Remond met with pilot school principals and their leadership teams last year to introduce the Living Laudato Si’ Energy Reduction and Management Plan project and explain what it was setting out to do. “The engagement with School leadership teams is essential,” she said. Last month Ms Remond handed a project report on one of the Brisbane pilot schools to Pope Francis, during the “Saving Our Common Home and the Future of Life on Earth” conference held in Vatican City, which marked the third anniversary of Laudato Si’. “The audience with the Pope was an amazing experience for the 500 who attended the conference,” she said. 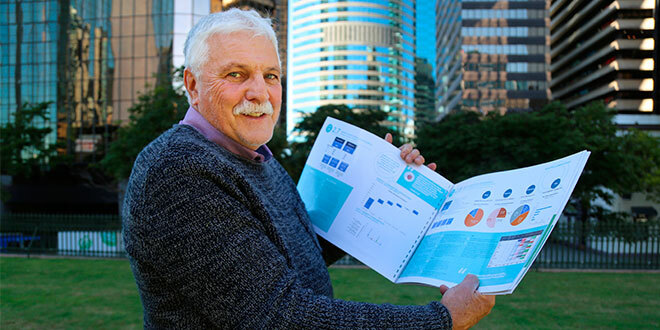 “I was really pleased to give him the Living Laudato Si’ Energy Reduction and Management Plan report to provide an example of the work that his leadership has inspired in Brisbane. “I think it is really important work that is being done. “We urgently need Catholic case studies, where Catholic organisations – in this case Catholic schools – are actually taking the message of Laudato Si’ and in terms of their energy consumption, reducing it and changing over to renewables. “That is a breakthrough in an Australian context. Ms Remond pointed to one earlier example at the All Saints Primary School in Liverpool, NSW became carbon neutral in 2010 through the leadership of the principal, who had read “On Holy Ground” and took the message seriously.